Get the best deals on Apple iPhones, Samsung Galaxy, MacBooks, Google Pixel, Lenovo, Oppo and more from Sept 25-27.Great news for Electronics enthusiasts, Paytm Mall is continuing with its flagship Mera Cashback Sale especially for Electronics from September 25 to 27th. Customers would be offered lowest prices on their favorite Mobiles, Laptops, and Home Appliances, whether it’s bought online on the Paytm Mall platform or offline from Paytm Mall partner outlets. All customers would win Lucky Lifafa, wherein customers will be able to receive a surprise gift after every order. 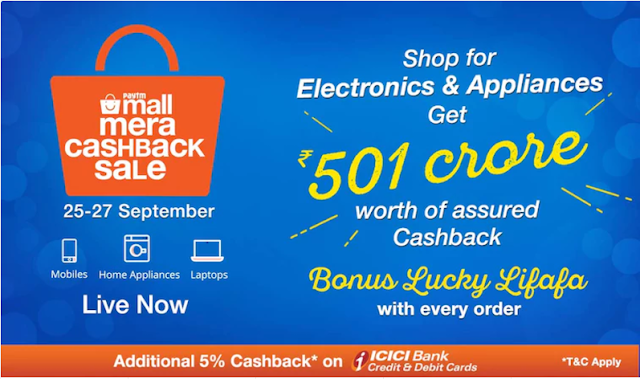 In addition to the most exceptional cashback offers, all ICICI Debit/Credit Cardholders will receive additional 5% cashback. Paytm Mall has allocated 501 Cr in assured cashback for the ongoing festive season as it works jointly with brand-authorized stores, large retail chains and small shopkeepers to host a wide range of products at massive cashbacks. SO guys this is all about paytm hotdeals go and get one for yourself. Stay tuned for more. Thank you for the reading.